This index is constantly evolving – stay up to date with new tips by following this blog, or my Tips For Travelling With Children Pinterest Board (which also includes tips from around the web) or by subscribing to the Tips For Travelling With Kids email list. 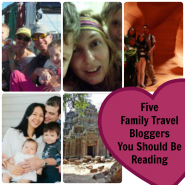 Most of these posts contain great comments from readers with experience of travel and young children, so be sure to scroll through. Five Ways To Usher Small Children Through An Airport Without Losing Or Killing Anyone. Harness, pull-along suitcase or stroller? This discussion should help you decide how to get from check-in desk to gate as one, harmonious group. You take the ankles and I’ll take the wrists. Before you travel with kids: working out your game plan for transition points in the itinerary. Ways to tackle seat-kicking in young travelling children, given that you probably can’t cut their legs off, especially considering airline restrictions against sharp objects. The greatest minds of this travel-friendly community combine to solve a perennial problem. The Land Of Nod: Sleep Options For Travelling With Young Children. This discussion includes ideas from resourceful travellers on how to bed kids down safely in the hotel room so they don’t roll off the side, get bitten by bugs, cost you a fortune or add too much to your luggage. Kids And Jet Lag: Your Sleep Issues Multiplied. Things to think about as you decide whether and how to cross time zones with babies and young children. Travel Snacks for Kids. Fourteen ideas for portable snacks that don’t require a supply chain worthy of the US military, plus advice on eating equipment. Children And Chopsticks. Introducing chopsticks to kids as young as two. Includes DIY learning chopsticks, what to look for when buying a set, plus a couple of bonus tips. Children And Squat Toilets: Everything You Ever Wanted To Know And A Whole Stack Of Things You Probably Didn’t. A how-to guide for helping young children use squat toilets – with pictures! The Toilet Training Traveller. Travelling with the nearly-there or just-trained child – everything I leant from the internet before travelling with our half-trained child, including a lot of things I decided to ignore in favour of temporarily going back to nappies. Delinquent Itinerants: A Guide To Discipline For Young Travellers. My thoughts on responding to poor behaviour in foreign places. Innocents Abroad: A Guide to Japanese Etiquette for Families Travelling with Young Kids. I interview Elle, a real, live expat living with her Japanese husband and their children just outside Tokyo, to get advice on etiquette for, well. Like it says. For kids who are extra-sensitive, reactive, or lack flexibility, see also the section on sensitive kids. Why We Travel With A Sensitive Child (outside link). Leila of Sensitive And Extraordinary Kids had me over and asked me this question, and this was my answer. Four Meltdown Triggers To Consider When Planning A Trip With Young Children. The triggers we keep an eye out for when crafting our itineraries, and three types of solutions we use. Ways To Stop Young Travellers Getting Overstimulated (Without Resorting To Actual Sensory Deprivation). Tricks to keep easily-overwhelmed youngsters from blowing their stacks. Five Equipment-Free Travel Games Which Help Ease Culture Shock By Promoting Gentle Engagement (Transport Edition). Using games to gently introduce sensitive children to foreign places from the safe distance of a car, bus, or train. Five Equipment-Free Travel Games Which Help Ease Culture Shock By Creating A Mental Cocoon (Transport Edition). Using games to help sensitive travellers take a break from their surroundings when it all gets too much. Six* Things To Pack For Sensitive Children (*or so). Bits of equipment which help sensitive travellers cope with the stresses of being away from home (and how we use them). How To Write Your Own Children’s Travel Guide (For Three To Eight Year Olds). This is my plug-and-play formula for writing an engaging children’s guide to your travel itinerary for your family members. I May Have Overshot A Little. A review of what’s worked with our sensitive traveller and the results so far. An Ordinately-Inordinate Number of Ways to Encourage a Young Child to be Unnaturally Quiet and Still without using a lot of Heavy and Possibly Illegal Equipment. Ideas for toys and entertainment for use when travelling, by age group (with some warnings). Ten (Comparatively) Fun Things To Do With An Airline Sick Bag. With lots more things added in the comments! See also the games we use to help sensitive travellers deal with travel in new places. One Weird Trick To Save Money For Travel (which isn’t what you think and your doctor doesn’t want you to know about it). Packing List. Our master list, which includes our core items, plus extra requirements for each developmental stage. Includes links to junior packing lists. Teaching Kids To Pack: A Prospective, Randomised, Uncontrolled Trial. A short stop on the long road to independence, and links to age-appropriate packing lists. Travel Insurance: The Devil In The Detail. Things to double check to make sure your family is adequately covered. Especially important for pregnant travellers or people on adventurous and outside-the-box holidays. The Parent (Child, Luggage) Swap. We’ve often split up on holiday to allow family members to follow their own interests, but this version suggests overlapping itineraries to extend the total stay, deal with jet lag, save money, and streamline luggage handling. Kid-Friendly Travel – A Manifesto. The philosophy we cart our kids around on trips by. The Cat Herder and the Organised Holiday. Travelling with young children involves a well-orchestrated kind of flexibility. These tips have helped hone my cat-herding skills so every “cat” gets enough of what they want from the holiday. You can also flip through the Trips In Planning category to get a feel for how we prep. Health Safety. Our rulebook for keeping our trips from becoming a world tour of medical facilities. Check out the kids’ travel health and safety Pinterest board for some great safety tips from other travelling families. Quick posts on tying it up with wire to keep the show on the road. 1. Pack new toothbrushes if you’re prone to leaving the “current” ones on the sink on the day. 2. Build a bigger head – an alternative to using smaller headphones. 3. How to run kids around safely whilst standing still holding a camera – a game to keep the kids focussed, exercised and entertained with almost zero effort on your part, and which also makes great travel memories for later. I have a review policy. All this stuff was bought by me and reviewed off my own bat. All trip overviews contain a challenges section which dredges out the troubles we ran into, how we tackled them, or what we learned to do better in our future travels. For example, in Penang we learned to set a less stimulating itinerary, in Tumpat we learned to pack mosquito nets for the kids, and in Bangalore we learned that fast food chains aren’t the same all over the world and that there’s only so long a two year old can ride a whirly-gig before throwing up. These also contain itinerary sections, which give a feel for how much we pack into one day or week when travelling with kids. But if you only want to read posts which give tips on travelling with children, you have two options: either follow my Tips For Travelling With Kids Pinterest Board (where I’ll also be adding stuff I find around the web); or fill in the form below and I’ll notify you by email (no more than once a month) when this page is updated. You’re welcome to request other topics or link to your favourite travel tips in the comments, or just, you know, whatever. You have some fabulous lists. This is wonderful, pity I didn’t read it before our journey! You asked me about the markers I had that were washable. I can’t find the comment now, but I wanted to respond. They were actually ones I got free with a Japanese kid’s magazine and I only took them on the outward journey and left them in Ireland, so I can’t even post a photo. However, on the way back I used Crayola washables (http://www.crayola.com/products/my-first-crayola-washable-markers-8ct-product/) , but this time I made sure she didn’T write all over the seat like on the way out! That time, I had left her for a minute to drop something off in a bin and couldn’t believe the artwork when I got back!! Sounds like you didn’t need the tips! Still can’t believe you kept three under four (it’s four, isn’t it?) happy on an indirect long haul flight (and made it in one piece). Just clicked through to the link. Crayola certainly do seem to have the washable market covered! What did you use to clean up with on the flight? Just a babywipe! It came off so easy. Aha! So the real secret of travel with children is *very, very low expectations*. It’s genius, and so very simple!